Our 34th Spring Ride is now over and was very successful. We had a great turnout of folks from all over the state. The weather was beautiful for Thursday and Friday, but did not hold up on Saturday morning—which poured rain—and then cleared again. When the riders got back to camp on Friday night the silent auction was all set up for everyone to take their time looking at all the wonderful items to bid on. 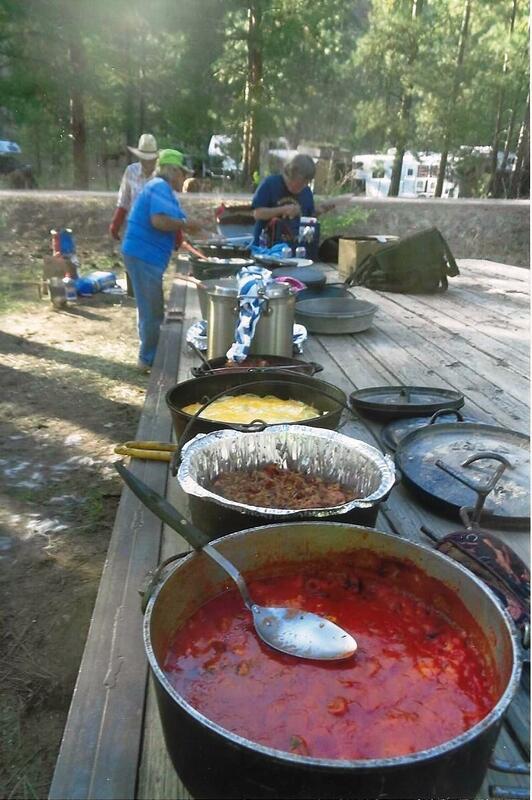 The Friday night “Dutch Oven” pot luck was a great meal—the “cooks” Willie Kemper and Joe Hebert had the cooking time estimated perfectly with at least 15 Dutch ovens so that all were done at the same time! 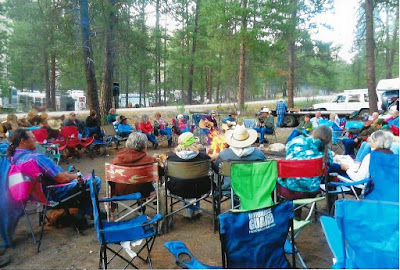 Then Brock Hires of Tonasket, Randy Edin of Everson and Richard Harrelman of Yakima entertained us with singing, guitar playing, and cowboy poems around the campfire. Saturday morning was raining for the Ride, but most folks rode anyway. Unfortunately, they didn’t get to see the white-capped Cascades as they were “socked in” by clouds. 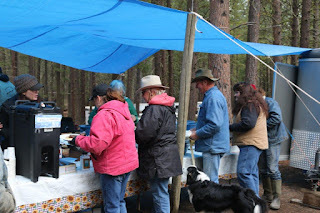 When we returned to camp, after playing our “Hands of Chance” poker, the silent auction bidding was going strong. 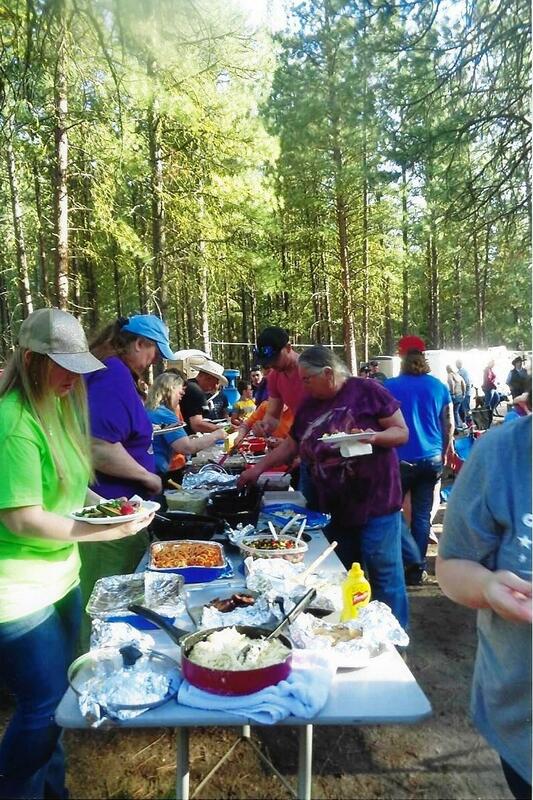 After the auction closed, we were honored with a wonderful BBQ steak dinner! 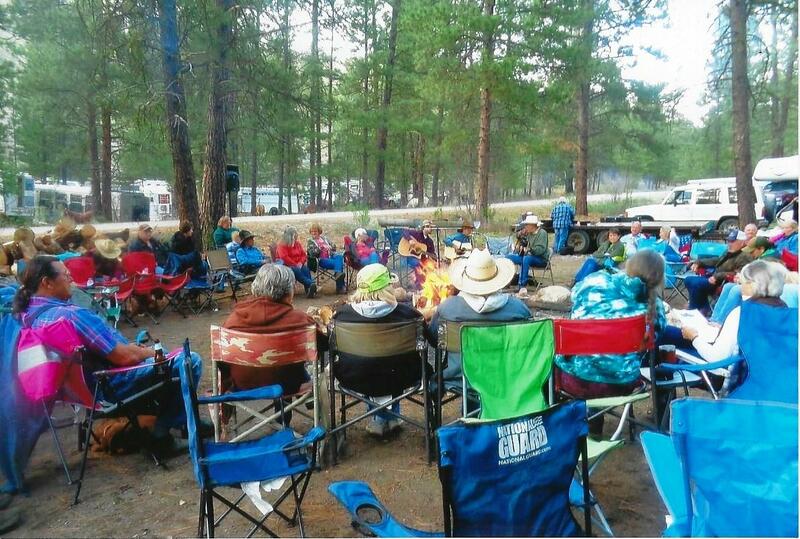 Again, on Saturday night we had a great night of campfire music and cowboy poetry. Jim Higginson of Bellingham had flown over and Dave Notter of Wenatchee added a fiddle to the entertainment. Sunday morning brought us a wonderful Cowboy Breakfast! The cooks and servers did a great job of taking care of everyone and we all enjoyed a fabulous meal before leaving camp and heading home. The Spring Ride doesn’t just “happen” — it takes lots of preparation over several months. 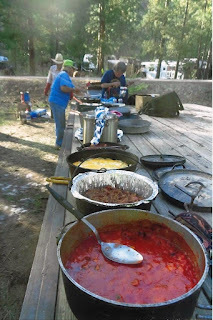 The week of the Ride, however, is particularly busy for just about everyone, but more so for the members who manage the ride itself. A “Lookie-See” scouting ride is done a few weeks before the Spring Ride by those members who know the area well. Their job is to determine the trail route for the day of the ride and be sure it is clear of fallen trees and other obstacles. Sunday April 15th was a cloudy and cold day, but Betty Wagoner, Julie Johnson, President Cathy Upper, and Mark Brantner rode into the west end of the Spring Ride route (from the Lester Road side) for the 2018 “Lookie-See” ride. 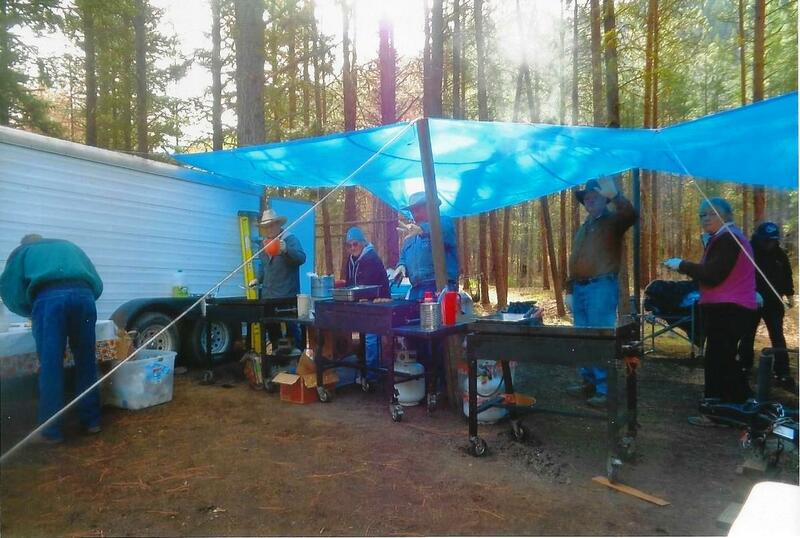 With much dismay, they found 25 to 30 dead and burnt trees down across the planned trail; the trees had been burnt in the 2014 Carlton Complex fire and had not yet been removed. Two days later member DK Williams and President Cathy rode up with a couple of chain saws and cut out the trail in preparation for the Spring Ride the next week. The Flagging ride was after the "Lookie-see" ride and just 5 days before the Spring Ride. 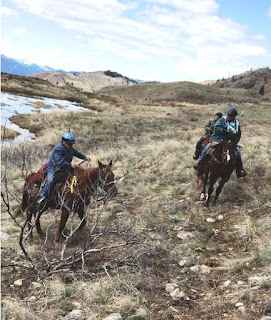 Thankfully, the weather was great and Betty Wagoner had 9 helpers to flag the trail for the Spring Ride. Those riding with Betty were Cathy Upper, Julie Johnson, Jackie Iddings, Anita Ellis, Heidi Weston, Mary Pat Bauman, Bev Phillippi, Kay MacCready, and Mark Brantner. Not too surprising, new trees were downed by the time the Flagging crew went through to mark the trail so member Willie Kemper went up to cut them out before the Spring Ride. The spring wildflowers had burst open and it looked like the Balsamroot would be in full bloom. 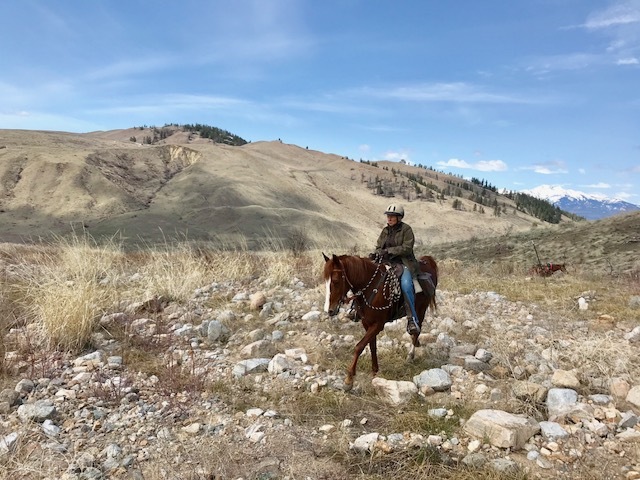 On May 14th Mark Brantner, Kay MacCready, Julie Johnson and President Cathy Upper had a great ride on Patterson Mountain. 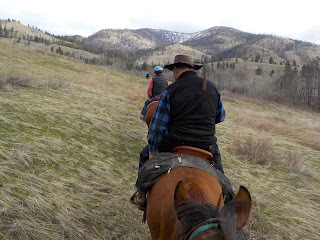 It was absolutely gorgeous day, and the group enjoyed magnificent views of the Methow Valley with the Cascade Mountains beyond, and the spring flowers that showed themselves made the trail especially inviting. 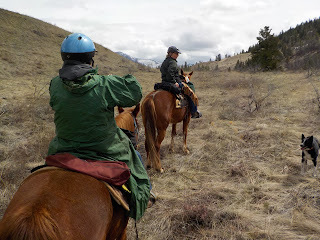 On May 19th a group of MVBCH members joined other Methow Valley Trails Collaborative groups to work on the Lewis Butte/Riser Lake trail in the Rendezvous area. 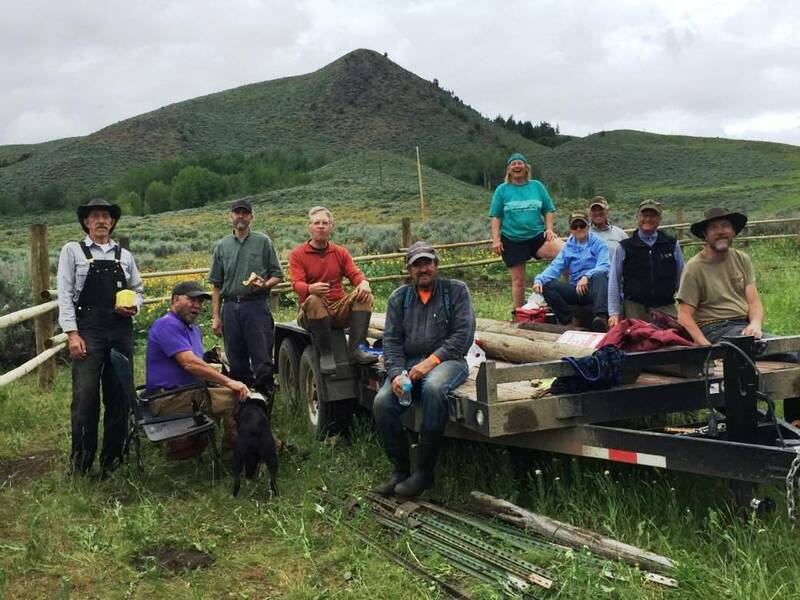 Our members’ job was to install post and 2-rail fencing around a new parking lot that will serve the Lewis Butte/Riser Lake trails.